A plurality of Americans continue to believe that an amnesty for illegal aliens would encourage more illegal immigration to the United States, new polling finds. A poll from Rasmussen Reports found that 41 percent of Americans say giving illegal aliens a pathway to U.S. citizenship would encourage more illegal immigration, rather than stop it. Another 39 percent said an amnesty would not encourage illegal immigration, while 20 percent of likely voters said they were not sure. Roughly 43 percent of white Americans say that amnesty leads to more illegal immigration, the most likely of all racial groups to say this. A majority of black Americans, though, agree that an amnesty will bring more illegal aliens to the U.S., with 37 percent saying this and another 31 percent saying they were unsure. The poll comes after a Morning Consult/POLITICO poll revealed last week that swing-voters are increasingly opposed to a year-end plan by Democrats and the Republican establishment to shut down the federal government if an amnesty is not given to nearly 800,000 illegal aliens who were shielded from deportation by the President Obama-created Deferred Action for Childhood Arrivals (DACA) program. Only about one in five swing-voters, or roughly 20 percent, want a government shut-down in order to force an amnesty for DACA illegal aliens. Likewise, 20 percent of Republican voters said the same. Just one month ago, 23 percent of swing voters said DACA amnesty was a “top priority” for Congress, as Breitbart News reported, revealing a three percent decline in support by independents for amnesty. Even among Democrats, a federal government shutdown to give amnesty to illegal aliens is not popular, with less than 35 percent of left-wing voters saying they support the plan, Breitbart News reported. In September, Attorney General Jeff Sessions announced the end of DACA. Since then, the open borders lobby, corporate interests, Democrats and the Republican establishment have scrambled to come up with an amnesty plan for the illegal aliens before March 2018, when DACA will officially expire. 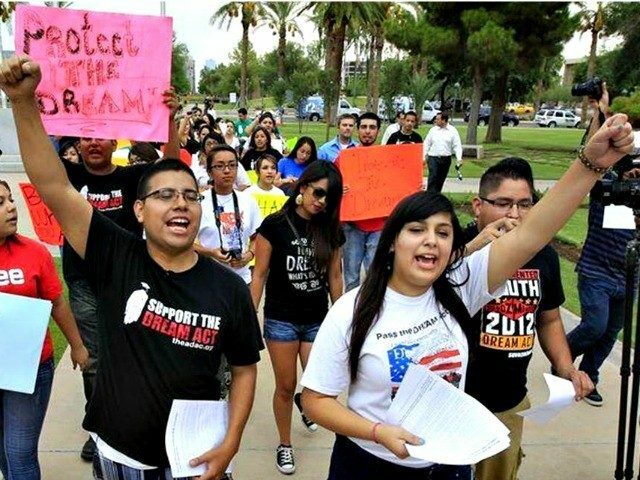 The latest effort to pass pro-American immigration reforms — such as halving legal immigration down to 500,000 immigrants a year by ending the process of “chain migration” whereby new immigrants being allowed to bring their foreign relatives to the U.S. — is coupled with an amnesty for DACA illegal aliens. Though the end to chain migration is tacked onto an amnesty, by greatly reducing legal immigration levels, whereby the U.S. currently admits more than one million immigrants a year, American wages would rise and blue-collar U.S. workers would be relieved from having to compete with the current immigrant-flooded labor market. At the same time, an amnesty for illegal aliens would betray President Trump’s base of supporters, as he adamantly opposed any such plan during the 2016 presidential election.